Plan du Port du Carenage ou Petit Cul de Sac de L’Isle St. Lucie. This beautiful little map depicts the Port du Carenage on the south side of the West Indies island of St. Lucia or St. Lucie. Depicts the small bay with numerous depth soundings and information on anchorage for both large and small ships. Also shows some inland features including roads, a small pre-Columbian ruin, and habitations. There is a compass rose decorated with a fleur-de-lys and radiating rhumb lines. 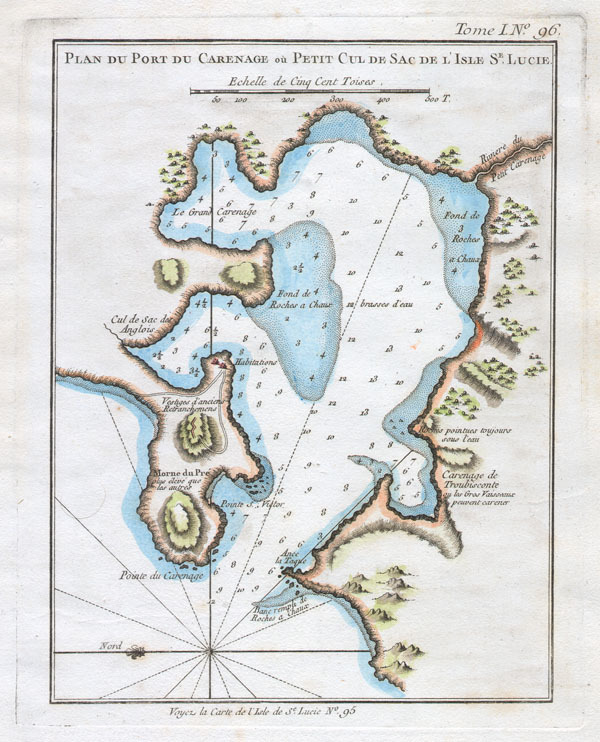 This map was published in 1764 for Bellin's Le Petit Atlas Maritime.